Urgent help needed for BamBam! BamBam needs lifesaving dental surgery! Please help us fund his operation! BamBam was surrendered to Longhopes Donkey Shelter by a horse breeder who purchased a property in Northeastern Colorado. BamBam came with the property, and the new owner did not want to pay to feed him. He had not been touched by a person in at least six years. His hooves were overgrown, and he was understandably very skittish! This smart donkey warmed up fast and once we got our hands on him, we discovered a wound on the bottom of his jaw. We had it cleaned out and stitched up and treated him with antibiotics, but it refused to heal, so we took him to the expert veterinarians at Colorado State University. 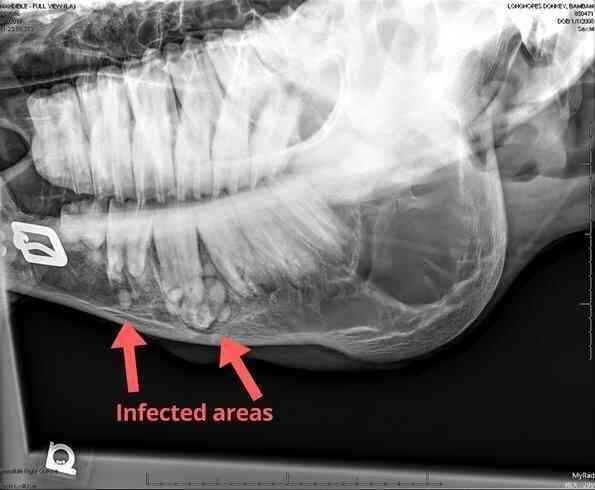 X-rays revealed an infection in one of his premolars that had spread into another tooth and was draining out the bottom of his jaw. The only cure is to remove the two infected teeth and clean out the infection. The other option is to euthanize an otherwise young, healthy, friendly donkey. We don't want to do that. With this treatment, BamBam can expect to live another 20+ years! The total cost of his operation is approximately $4,000. CSU is funding $1,100 of his operation through our volunteer program. We need to raise the rest so that BamBam can go on to live a healthy life! Please help if you can. 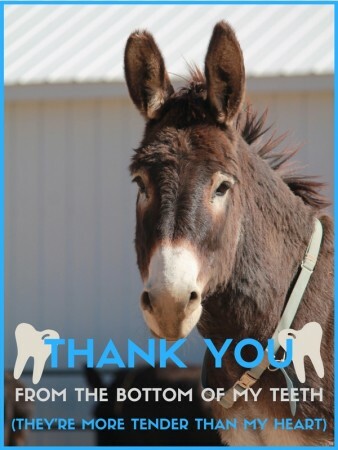 Thank you SO MUCH for your generosity! We have reached (and exceeded!) our fundraising goal for BamBam, and because of your amazing kindness, he is going to have his operation! We made the appointment for his surgery, and it is scheduled for Tuesday, April 4th at the Colorado State University Veterinary Teaching Hospital. We will keep everyone posted about his operation and recovery. Thank you for making it possible! I’m helping "Longhopes Donkey Shelter" help this sweetheart get better. Please help too by donating or sharing with others. Thanks! I just made a donation to "Longhopes Donkey Shelter" to help this sweetheart get better. Please help too by donating or sharing with others. Thanks! Your generous donation goes directly to Longhopes Donkey Shelter, less credit card processing fees. GivingGrid.com does not take a fee from Longhopes Donkey Shelter. Please help a little more to support GivingGrid's operating expenses and keep the service free to Longhopes Donkey Shelter. Why? Unlike most other services, we don't charge Longhopes Donkey Shelter any fees. It's free to them.